NAMIBIA, Africa | Geological extremes make Namibia a formidable prospect at first glance. They are colossal; from the ancient Namib Desert — one of the driest region on earth — to the haunting, windswept Skeleton Coast littered with the bones of 18th-century shipwrecks, and the towering fire-red dunes that rise up from the scorched central regions. Yet Namibia is leading the way when it comes to responsible tourism. The first African country to add the protection of the environment to its constitution, it's properly one of the good guys when it comes to the environment, economy, culture and resources. A fragile beauty, still isolation and vast skies of this scarcely populated country in south-west Africa, make Namibia a must-visit destination for sustainability-conscious tourists interested in experiential travel. Despite only gaining independence from South Africa in 1990, the country made forward-thinking decisions about safeguarding Namibia’s ecosystem and became the first country in Africa to place conservation at the heart of its manifesto. Local communities were given the chance to move into ‘communal conservancies' and were provided with skills which helped them protect wildlife. This successful model of conservation meant that poaching fell and wildlife flourished, while rural communities acknowledged that tourism was the vital link to bringing them positive economic benefit. Namibia now has the largest quotient in the world of free-roaming animals including the rare black rhino, lion and zebra, and the largest number of cheetah in Africa. This, in turn, has attracted visitors who are looking for unique travel experiences — here, you can track big game on ancient animal pathways, rather than on a tick-box game drive in a fenced national park. Such a diverse, protected ecosystem lets visitors focus on the unique and the extraordinary. The arid, seemingly lifeless land, hosts a variety of desert-adapted plant and wildlife. Harsh conditions have dictated that animals must evolve to survive: beetles collect condensation on their backs as rain is scarce, elephants have thinner legs to adjust to longer distances for food and water, and the Welwitschia plant lives so long it becomes a fossil. Setting an example to the rest of Africa, and the world, it is crucial that hotels and lodges follow exemplary conservation practices. 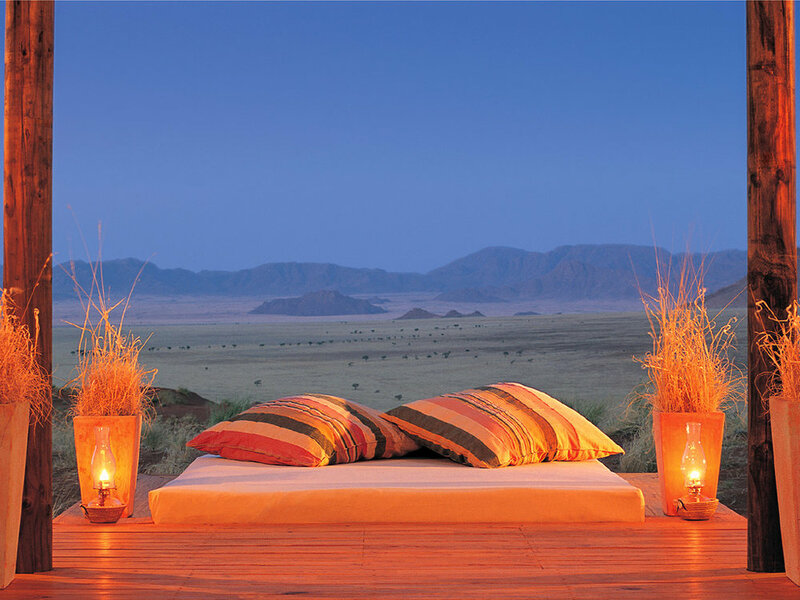 Wolwedans is a collection of luxury camps and lodges, scattered around the tangerine-orange boulders, desolate plains and ancient mountains of the 170,000-hectare NamibRand Nature Reserve. Wolwedans' strict ethos prioritises the safeguarding of the pristine NamibRand ecosystem through initiatives such as animal monitoring and clearing non-indigenous species to allow biodiversity to flourish. Tourism is low-impact: structures are wood or canvas, and use sustainable technology, and strict regulations mean you won't see another vehicle while game-spotting. Wolwedans also has its heart firmly in Namibian culture and its people. The Wolwedan Foundation helps local communities through an Artisan School, a training school for Chefs in Windhoek and a sustainable laundry project in a nearby village, among others. Wolwedans understands that giving back to the community is key to protecting the long-term conservation goals. Here, sustainability has become a way of life, which works harmoniously with its people, the land and the wildlife. The link is the inquisitive tourists that come here, gaze at the star-filled skies, traverse the shifting rust-red deserts and return home spilling with stories of a wildly beautiful land.